This novel, written by Sir Arthur Conan Doyle in 1912, tells of Professor Edward George Challenger’s quest for dinosaurs in a prehistoric lost world. This novel, written by Sir Arthur Conan Doyle in 1890, is a collection of 10 short stories. Doyle documents the atrocities committed in the Congo Free State, the personal possession of Leopold II of Belgium. A book of pirate stories representing some of Conan Doyle’s non-Sherlock-Holmes writings. The letters of Mr. Stark Munro, narrated by Sir Arthur Conan Doyle. A young Welsh medical student enters the boxing ring to fight for a £200 prize which will enable him to establish his own practice. John Girdlestone owns the firm of Girdlestone. It is a very lucrative business and John Girdlestone and his son Ezra Girdlestone are respected by everyone. Both father and son are cynics and have no other thought but for their business; after giving a donation of £25 for charity, John Girdlestone remarks to himself that it is not a bad “investment”, as it will make a favorable impression on the collector, who is a Member of Parliament, whose influence he hopes to use some day. 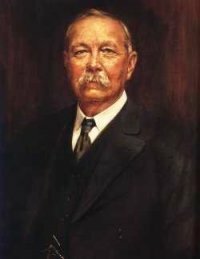 Tales of Terror and Mystery is a collection of 12 stories written by Sir Arthur Conan Doyle in 1923. In some of the stories in “Tales of Terror and Mystery”, a suppressed uneasiness gradually builds up and evolves into sheer terror. In others, the story line unexpectedly changes and comes to a horrific conclusion. All stories definitely promise you an entire world of intriguing characters written in Sir Arthur Conan Doyle’s typical genius style. Beyond the City is a novel written by Sir Arthur Conan Doyle and published in 1892.